Each contemporary log cabins comes with tongue & groove roof and floor. Joinery doors & windows with real glass, lock and key. 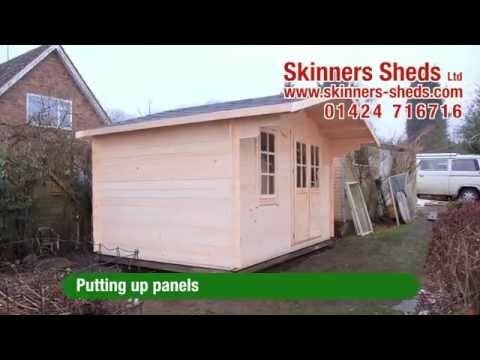 If you would like a cabin erected, have peace of mind that our expert team have many years of experience. A perfect base is required for these cabins as all walls are computer cut. There is very little tolerance. The buildings must be treated and sealed to prevent water penetration as soon as possible. 28mm Wall Thickness Overall Dimensions: 3.5m (Width) x 2.5m (depth) External W..
DimensionsWall Profile: 28mmWidth: 3.5mDepth: 3mWall footprint width: 3.5mWall footprint depth:..
DimensionsWall Profile: 28mmWidth: 4mDepth: 3mWall footprint width: 3.8mWall footprint depth: 2..
DimensionsWall Profile: 44mmWidth: 2.5mDepth: 2.5mLarge front canopy Not included in overall me..
DimensionsWall Profile: 28mmWidth: 3.5mDepth: 3.5mWall footprint width: 3.3mWall footprint dept..
DimensionsWall Profiles: 44mm, 70mmWidth: 2.5mDepth: 2.5mRidge height: Under 2.5mWall footprin..
DimensionsWall Profile: 44mm or 70mmWidth: 2.5mDepth: 3.5mRidge height: Under 2.5mWall footprin..
DimensionsWall Profiles: 44mm, 70mmWidth: 3mDepth: 3mRidge height: Under 2.5mWall footprint wid..
DimensionsWall Profiles: 44mm, 70mmWidth: 3.5mDepth: 3.5mRidge height: Under 2.5mWall footprint..
DimensionsWall Profile: 44mm, 70mmWidth: 4mDepth: 3mRidge height: Under 2.5mWall footprint widt..
DimensionsWall Profile: 44mm, 70mmWidth: 3.5mDepth: 3mRidge height: Under 2.5mWall footprint wi..
DimensionsWall Profile: 28mmWidth: 5mDepth: 4mRidge height: Under 2.5mWall footprint width: 4.8..
DimensionsWall Profile: 44mm, 70mmWidth: 4.35mDepth: 1.85mRidge height: Under 2.5mWall footprin..
DimensionsWall Profiles: 44mm, 70mmWidth: 5.5mDepth: 2.5mRidge height: Under 2.5mWall footprint..
DimensionsWall Profile: 44mm, 70mmWidth: 3.5mDepth: 2.5mRidge height: Under 2.5mWall footprint ..
DimensionsWall Profiles: 44mm, 70mmWidth: 3.5mDepth: 4.5mRidge height: 2.5mWall footprint width..
DimensionsWall Profile: 44mm, 70mmWidth: 5mDepth: 3.5mRidge height: Under 2.5mWall footprint wi..
DimensionsWall Profile: 44mm, 70mmWidth: 5mDepth: 4mRidge height: Under 2.5mWall footprint widt..
DimensionsWall Profile: 44mm, 70mmWidth: 4mDepth: 4mRidge height: Under 2.5mWall footprint widt..